Interview with Lauren of Lose Time Reading! 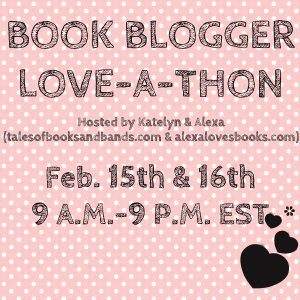 So, we signed up for this Book Blogger Love-A-Thon deal, and, even though I’m still not sure exactly what that means, the best part was that we got paired up with another blogger to interview. It gave us a good reason to check out another blog that we might not have discovered otherwise, and it was super fun coming up with questions for Lauren. We totally enjoyed getting to know her, and you should go check out her blog too – after you read her awesome answers below! We won’t ask why you started book blogging, because that’s right on your “about me” page. So, we’ll ask this – how has book blogging changed how you read? The main thing it’s changed was how MUCH I read. I was still a big reader before blogging but I would read probably between 4 to 6 books a month, now I read between 10 and 15 a month! I also have much more broader tastes. I wouldn’t have considered about 95% of the books I read now prior to blogging! So, you mention that you love organizing AND you clearly love books. Do you keep an organized TBR list? Track your book stats by different categories? (No pressure…we don’t judge either way! Okay, we see Divergent on your fave series list! We are not in agreement on the series (our joint review is here). What’s your take on the progression from the beginning to that end? Hardcopy 100%! I do love my Kindle, it’s light and so easy to take to work but if I had to choose one for the rest of my life, I would always pick the hardcopy. This is boring… it’s actually my bed. I just want to be comfy when I read and curling up with a ton of pillows, my cat and a book is the perfect way! Thank you ❤ I don’t really have many tips honestly, except do what you love. You look at your blog more than anyone so make sure that YOU love it! Everyone has different tastes so you can’t appeal to everyone! I did a lot of Googling and looking up tutorials and design techniques. I’m constantly adding and changing things and I think that’s the funnest part. I started out on Blogger, but after a few months switched to WordPress because I wanted a bit more freedom. Well… It was terrifying once I started, I had no idea that it was a completely different than Blogger (research would have been helpful!) so I spent a good week learning how to fix things and making a layout to fit a theme. It kind of worked out in my favor though because now I can use WordPress enough to manage and I learned quite a lot! Google really is your best friend! I am definitely not someone who likes book-turned-movies but I do have a few favorites (that of course I can’t narrow down! ): Anne of Green Gables, The Devil Wears Prada, The Harry Potter series, The Narnia movies, and The Notebook. I think The Hunger Games and Beautiful Creatures are probably my least favorites, at least my most recent least favorites. I didn’t dislike THG but I was just disappointed overall. I also liked a lot of Beautiful Creatures but it was much too different from the book for me to love it the same way. You start reading something that you’re just not digging. Put it down, or forge on? Oh, the question of the year it seems! I’ve only recently been more open to DNFing a book. I have done it in the past but more often than not I will forge on, I just feel like it may get better and THEN what? Code Name Verity bored me to tears for the first 40% of the book but I pushed through and it’s now one of my all time favorites. Recently I have put several books aside though and I realized that I haven’t even thought about them. There are just SO many books, why waste time on something that you are not enjoying? Oh we see you mention a requesting/accepting review copies problem! One of us might be developing that problem! What’s the best thing about review copies – besides the obvious free books!? I like getting the change to read books before they are in stores! I’m not really sure why, it’s just something that I always thought was interesting since I started blogging. I really enjoy being about to rave about a book on release day, tweet about how awesome it is and support different authors as well. I have also had a chance to try books I normally never would have picked up because of it! It’s a neverending cycle though… It really can become an addiction because there are just SO many eyecatching titles! Favorite book is too hard of a question so, how’s this – what book comes to mind when you think about how much you love reading? This is going to be a very random answer but The Baby Sitters Club series by Ann M. Martin. I have read a lot since I was a little girl and my absolute favorite books were BSC. Whenever I was able to go shopping with my Mom I would make a list of titles that I still needed and then carefully pick out which ones I wanted at the bookstore. She would also take me to secondhand bookstores and I would find a lot of the ones I needed there. I cherished these books, and one of my favorite reading memories was when I was home sick from school with a head cold. I curled up in my bed and read several Super Specials. Despite being sick, I had a ton of fun that day!